The sculpting power of the waters of Neon Canyon created a mid-channel cavern whose domed ceiling has three massive skylights. From the interior of the chamber the entire structure may be seen in the reflection pool. Courtesy of Thomas Holt WardSojourners are lost in reverie gazing into the earth house mirror. 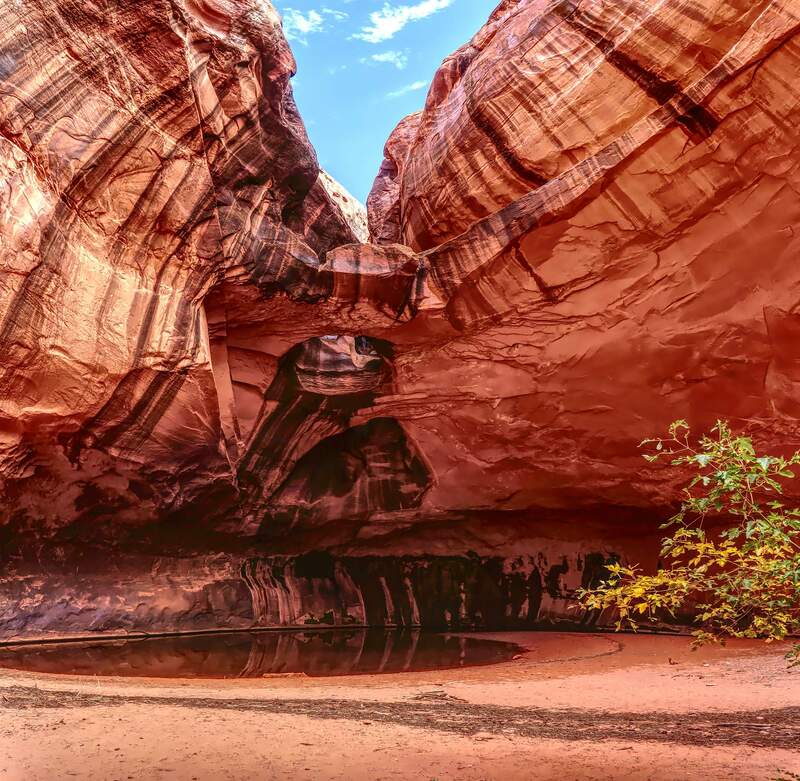 Imagine descending a massive sandstone slab, fording a mighty tributary of the Colorado River, walking up a canyon whose perpendicular walls glisten and entering the Golden Cathedral, a deep glowing grotto. The over-arcing ceiling has three apertures, vertical shafts forming natural bridges. 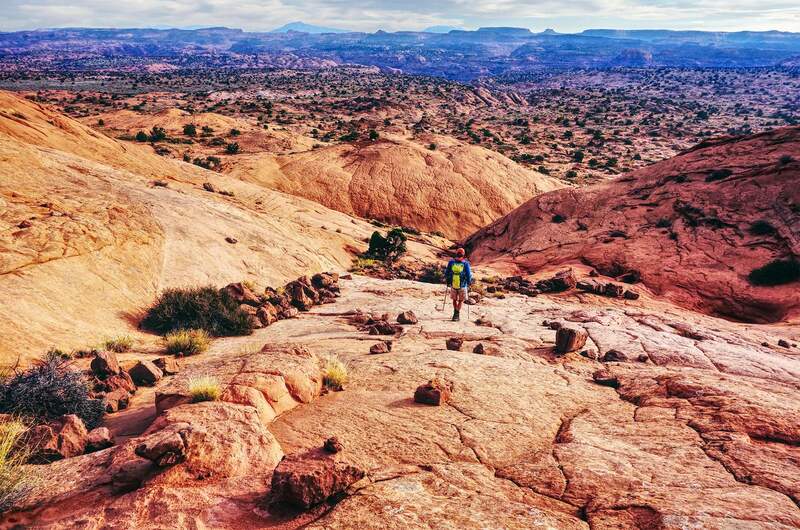 This hike is within the Glen Canyon National Recreation Area, a day’s drive from Durango. 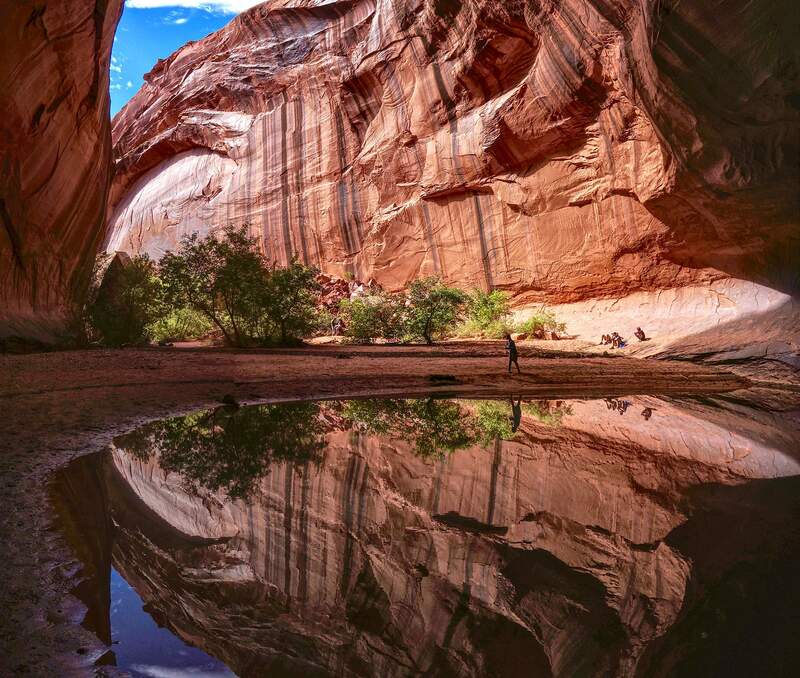 While you’re out there, plan to spend several days exploring the region off Hole In The Rock Road, proximal to Escalante, Utah. This trek is best suited for those who enjoy hiking freestyle and navigating by landscape features in the absence of a trail. Down the Sandstone SlabAfter signing the trail register, pause at the trailhead – elevation 5,620 feet – to get your bearings. From the upland rim, the Henry Mountains may be seen skimming the eastern horizon. Point 5,270’ is a standout rounded dome marking the entrance to Neon Canyon. 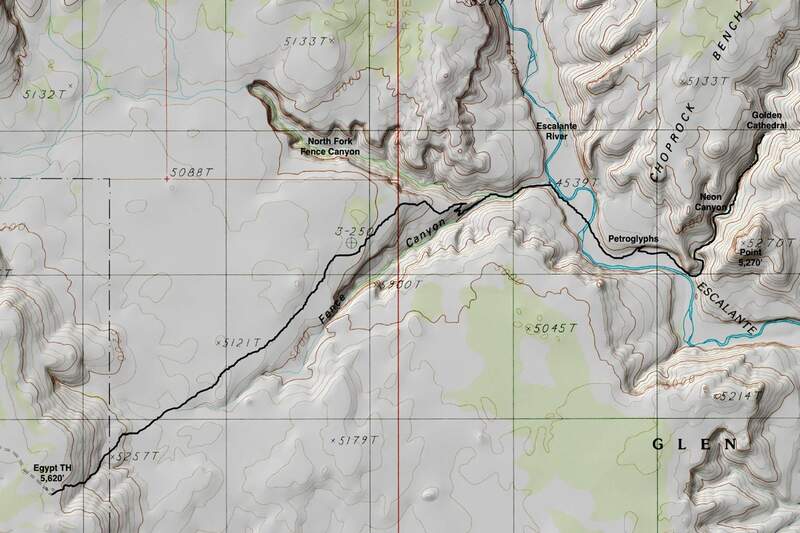 Initially, the route bears northeast paralleling the north rim of Fence Canyon. There are two sedimentary strata in this location. The predominant rock in the Carmel Formation is limestone, once a shallow sea shelf. It forms a resistant cap that slows the erosion of the underlying Navajo Sandstone. Dark brown Carmel blocks hurtle down the slickrock. Debra Van Winegarden/Special to the HeraldFrom the upland rim, descend the escarpment on a sandstone slab. The Henry Mountains skim the eastern horizon. The initial sandy track directs onto the slab. Flow down the slope on pink stone and red earth. Cowboys chiseled deep steps for horses and cattle on the zigzagging historic stock trail. A proliferation of rock stacks makes cairn hopping haphazard inside the bowl. Just bear generally northeast avoiding the steepest friction pitches. Walk down a fluted rill masterfully sculpted by water and wind. In 0.7 mile, you will have blissfully dropped 450 feet to arrive on the Egypt Bench. Look back and reference the location of the trailhead. The trail is not maintained across the sandy flat with bubbles of sandstone. Random cairns make navigation more difficult than it really is. The juniper-dotted plain is incised with the north fork and the main fork of Fence. Stay between the canyons. There will inevitably be streams of footprints; a clear trail should materialize at about 1.7 miles, south of two low-rising buttes. The platform tapers to a thin wedge. Near the apex, an old stock trail winds down through broken cliffs into the main fork drainageway where large oak trees mix with cottonwood. The north fork, a spring-fed perennial stream, joins the main. Horsetails and willows flourish along the watery way. Down the Escalante RiverArrive at the Escalante River at 3.3 miles, 1,100 feet below the rim. Start wading downstream immediately, skirting around the initial wall. Emerge at first opportunity downcanyon-right. I have been in the river at this location when it was running thigh deep, cold and fast. Trekking poles are helpful. Protect sensitive gear. Wingate Sandstone cliffs are far apart and the river changes its meandering course occasionally on the wide flood plain. You will likely ford three times in the next mile. Debra Van Winegarden crosses the Escalante River. In springtime the river can run cold, deep and fast. We are delighted to discover a social trail barging through tangled riparian habitat: tamarisk, willow, rabbitbrush and cottonwood. When I was here in 2005, there was no trail and the experience was miserable – seeds and spiders, scratches and vegetative pushback. At 3.9 miles, locate a petroglyph panel downcanyon-left. It is on a varnished sheer wall above a red bench covered with gray cobbles. The panel is 20 feet high and more than 100 feet long. Humans have been pecking images into this wall-of-record for more than 5,000 years. 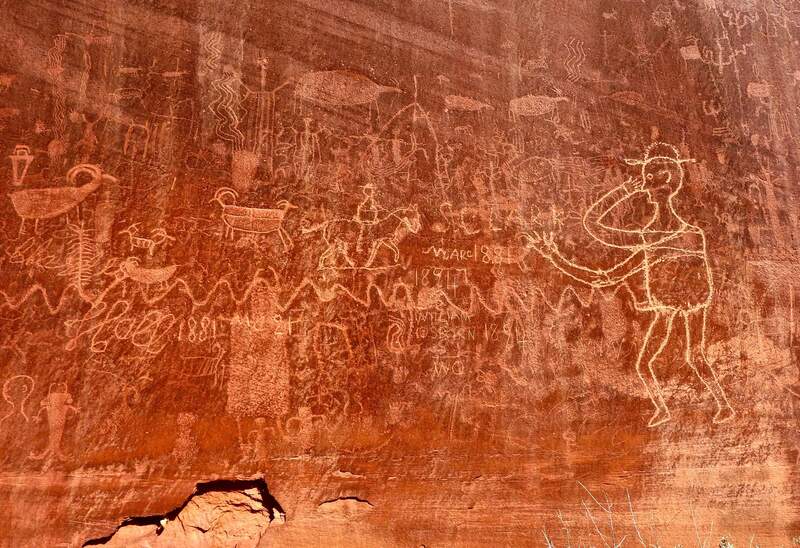 The abstract geometric petroglyphs are the rock art of hunters and gatherers dating from the middle to late Archaic period, beginning in 3000 BCE. You will also see a cluster of anthropomorphs in distinctive Glen Canyon Linear Style from this time period. Note the bear prints and human footprints going up the wall. Broad shouldered anthropomorphs and bighorn sheep are that of Ancestral Puebloans, dating from 1000 BCE to 550 CE. Humans have been pecking images into this wall-of-record for 5,000 years. Early pioneer Charles Hall added his inscription in 1881. Cowboys pecked right over the top of ancient images. Elaborate horned anthropomorphs with hair-bobs distinguishes the Fremont Culture, 500 to 1300 CE. Beneath an elongated snake Charles Hall added his inscription in fancy cursive in 1881. Pecked over the top of these ancient images are cowboy glyphs. Two renegades have their fists raised, ready to duke it out. Please, do not touch the wall. Neon CanyonContinuing on the downriver trail, Neon is the first side canyon on the left at 4.2 miles. Walking up the flat, sandy floor, delicate green vegetation contrasts with shimmering walls. The whole canyon glows. Textural and color components create a perpetual tapestry: sheer and lumpy; opaque and shiny; black patina and purple-red Wingate; machined concentric circles and solution cavities. A tiger wall folds softly overhead. Caution: poison ivy encroaches on both sides of the path. Golden CathedralA fallen boulder 0.8 mile upcanyon squeezes the entrance into the nave of the Golden Cathedral, an enormous circular amphitheater with a soaring overhanging roof. Upon the floor is a shallow glassy reflection pool. Water is at rest for now. It is hard to fathom that this gentle fluid bored out the entire stone sanctuary over time. Shafts of light stream into the upper reaches of the vaulted ceiling. Sojourners are enveloped in contemplative silence and peacefulness. From the trailhead, descend the escarpment on a sandstone sheet. Walk northeast across the Egypt Bench. Locate a well-defined trail near the apex of the wedge between the two arms of Fence and descend to the Escalante River. Walk and wade downstream to unofficially named Neon Canyon. Walk upcanyon to the Golden Cathedral. Return as you came. The climb out on the stone sheet is indelibly etched in my memory as one of the most pleasurable segments of this, or any, hike. The relationship between footfall and the dictates of stone sustained over the eons is one of symbiotic perfection and will continue to be just so over the coming centuries. For those practiced in orienteering, it is possible to create a loop by returning on the Beeline Route. See debravanwinegarden.blogspot.com. Travel: From Escalante, Utah, drive five miles east on Utah State Route 12. Turn south on Hole In The Rock Road and proceed for 16.7 miles. Watch for a small brown sign with white lettering, “Egypt 10 mi.” Turn east and zero-out your trip meter. The road initially presents as flat and graded washboard but it gets rougher as you go. At 2.8 miles, continue straight. The ford of Twentyfive Mile Wash at 3.5 miles is potentially the greatest hazard, especially after rain. Drive cautiously over a stretch of bumpy bedrock. At a “Y”, 9.5 miles, go right. Park at ten miles in a large circular lot. Four-wheel-drive with moderate clearance should suffice. There are no facilities and no water at the trailhead. Allow 1 hour, 10 minutes to 1½ hours from Escalante. Distance and Elevation Gain: 10 miles with 1,400 feet of climbing. 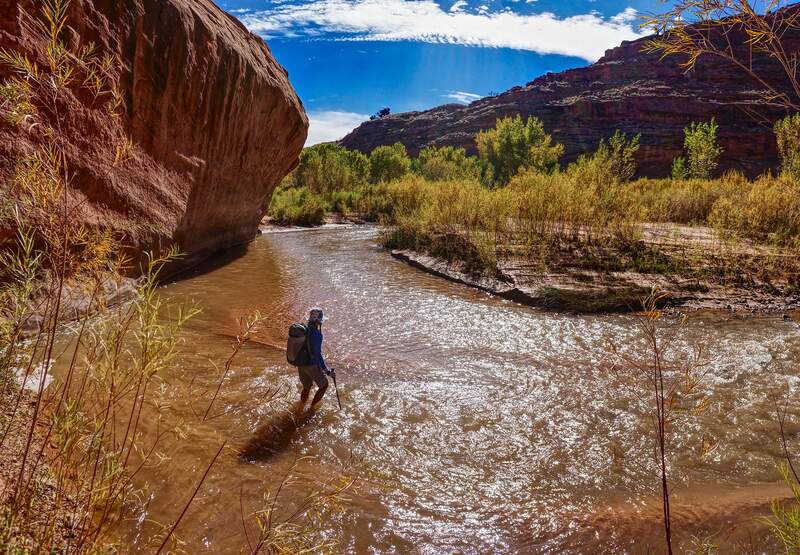 Difficulty: Primarily off-trail; navigation moderately challenging; no exposure; potentially deep wading in the Escalante River (bring water sandals); flash flood hazard in Neon Canyon.